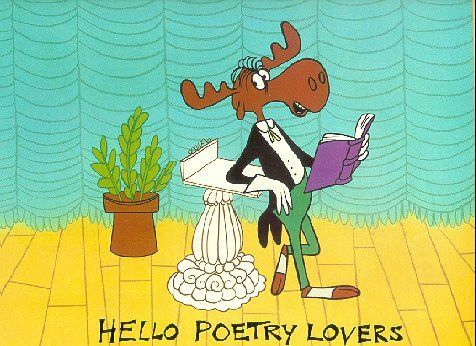 Bullwinkle, appreciating the hell out some poetry. Every now and again, when I’m feeling intellectually illiterate or a bit lowbrow, (anyone who has read this blog to any extent can understand how frequently that may be) I will resolve the feeling by appreciating poetry. I just head to my closet, yank out my poetry sack, pull out a big wad of poetry, and appreciate the hell out of it. Note: my poetry sack also serves as a repository for random unmatched socks. If you can even remotely understand the meaning of a poem, it isn’t a proper poem. Poems tend to be vague or nebulous. Poets like to throw around a dizzying menagerie of random imagery, designed to confuse and disorient. If you’ve just finished reading a poem and you haven’t vomited in your mouth a bit, it isn’t proper poetry. When a poet writes a poem about a leaf being blown from a tree, falling to the ground, and being trampled underfoot, he’s not actually writing about a leaf being blown from a tree, falling to the ground, and being trampled underfoot. The leaf represents hopelessness, and the futility of a life marred by series of tragic events. The leaf being blown from the tree represents a life spiralling into an alcohol fueled abyss of despair. The leaf being trampled underfoot represents the crushing weight of an uncaring world and inevitable grip of death. Poems are written to evoke an emotional response from its readers. Once after reading a collection of poems by Sylvia Plath, I spent hours curled-up on the floor in the fetal position as I sobbed uncontrollably. Note: I don’t want to paint the picture that all poets are emotionally distressed alcoholics with father issues– but the really good ones are. Limericks are short humorous poems with a strict meter and A-A-B-B-A rhyme scheme. They tend to revolve around a man with an odd ability, from a small island off the coast of Massachusetts. Sonnets are fourteen line poems that rose to popularity in the 13th century. They tend to be written by William Shakespeare and lovelorn teenage boys who are trying to impress teenage girls who are way out of their league. Haiku is not proper poetry, let’s all just stop pretending that it is. These are lengthy poems that generally involve deeds of heroism. A few examples of epic poems: Divine Comedy by Dante, Paul Revere’s Ride by Henry Wadsworth Longfellow and Horton Hears a Who by Theodor Seuss Geisel. Don’t be fooled by this charlatan, while he may be the brilliant author of dozens of classic children’s books, he is not and has never been a medical professional. Be sure that you know the difference. You don’t want to be chatting up a girl who is gushing over her love of Emily Dickinson when you say, “I know, she was smoking hot in Big Bad Mama.” Seriously– it ends badly. This is not Emily Dickinson. The Baltimore Ravens, the NFL franchise in Baltimore, is named after Edgar Allan Poe’s The Raven. Note: if I had named the NFL franchise in Baltimore after an Edgar Allan Poe poem, I would have called them the Baltimore Conquering Worms. How much cooler would that have been? I once wrote an essay in college, explicating The Tyger by William Blake, on which I received a grade of 99%. Take that doubters. You are now ready to pull out your own poetry sack, and start appreciating the hell out of poetry. I don’t want any whiny comments from people who love Haiku, write Haiku, read Haiku, or though the certifying of some bizarre clerical error at the hospital, have been named Haiku. It was just a joke…mostly.